Shugendō practitioners in the mountains of Kumano, Mie. Esoteric practices related to Cundī have remained popular in Chinese Buddhism and the Sinosphere. A typical Shingon shrine, with Mahavairocana at the center of the shrine, and the Womb Realm and Diamond Realm mandalas. Three ritual implements: vajra, bell, and counting beads. 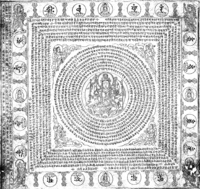 Chinese use of the Siddhaṃ script for the Pratisara Mantra. 927 CE.